Another week down and it was even my first week back to teaching! So it was a busy, big week for me. I teach private music lesson out of my home and during my lessons on Tuesday, Collin slept the whole time in his swing and part of the time in the swing during my Friday lessons. He did pretty well, but I only had 3 lessons this past week and this coming week is a full schedule, and Matt is out of town, OY! so we will see how it goes with having a babysitter and all. This weeks workout went really well. 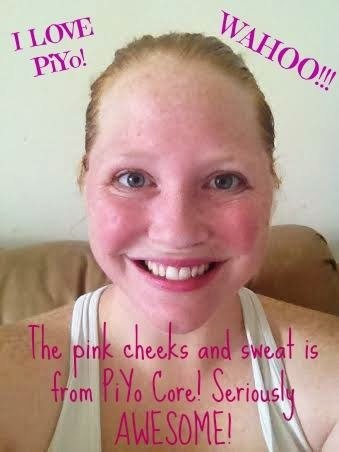 I did a re-do of my weekly workout for PiYo since I missed so many the previous week and I did very well this week! My legs were sore from the Buns workout for 4 days! CRAZY! Just finding the time is the hard part. My goal this past week was to wake up early to exercise and I couldn't. Collin starting waking up in the middle of the night to feed and I have been an exhausted zombie mommy all week so waking up at 5 am when Mace and Collin were sleeping in till 7:30 didn't work. Thankfully they both go down for Mommy quiet time at the same time so early afternoons are working. Saturday: 3ish mile run (ran with the training program today sans Collin so I really got to get out there! Wasn't consistent running as I was stopping to help cheer ladies on their runs but I joined some ladies and ran with them, double backed and joined other ladies and so forth. It was pretty cool and I was was pretty worn out. Ran back in with M and she KILLED ME! I was running at a faster pace than I am used to which is good and we were working on hills! Life of a Busy Mommy! Friday's 5: What NOT To Do For A Race!